Regular readers of my blog would have seen my valuation of Metcash (MTS) published on October 5th. At the time Metcash was trading at $2.59. The share price rose to $2.91 (closing price on the 11/11) before falling precipitously over the last two days. 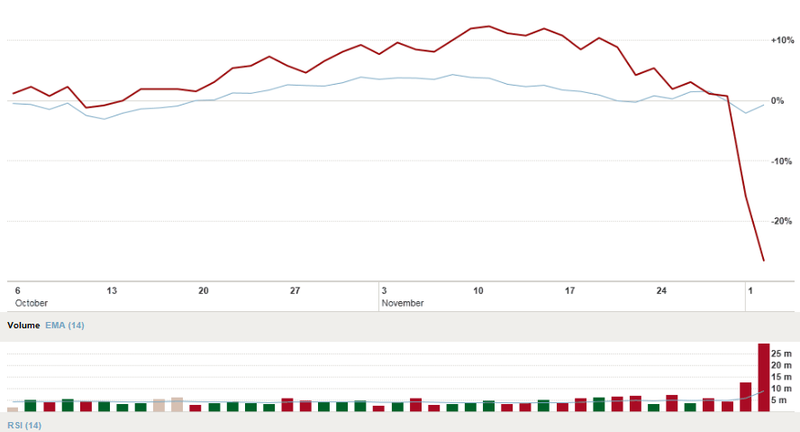 The chart below shows the performance* of MTS (red line) versus the S&P ASX 200 index from the 6th of October through to the 2nd of November. So what happened? MTS released its half yearly results (1H 2015) on Monday. Here’s a quick summary. Overall revenues were up 1% to $6.6 billion. 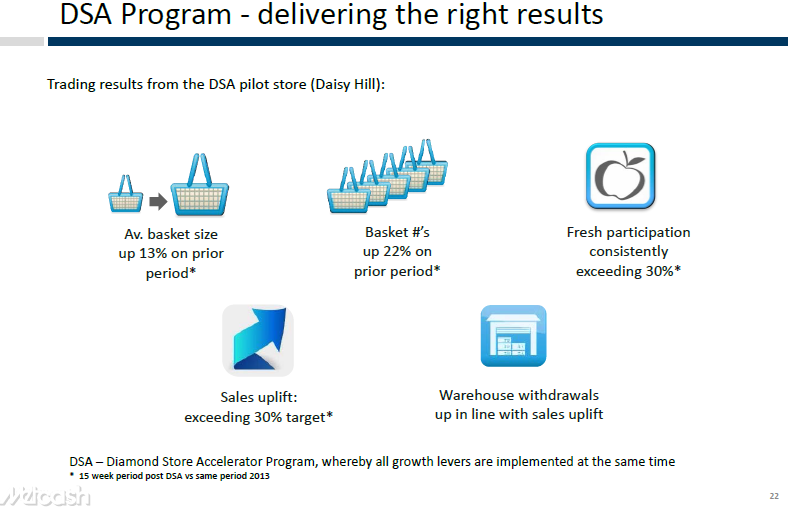 Same store sales were up 7.4% for convenience, 0.9% for retail food and grocery. Net profit before one-off items fell by 9%. Underlying EPS fell from 12.7 cents to 11.4 cents (-10.2%). Interim dividend fell from 9 cents (DPR 75%) to 6.5 cents (DPR 57%). Margins fell from 2.8% to 2.6%. Same store sales for food and grocery division (wholesale) fell by 1.5%. MTS announced back in March 2014 that it would embark on a $675 million capital investment program (in-store refurbishment and the construction of a state-of-the art warehouse). As a consequence, the dividend would be cut to help fund the capital expenditure program. The company also provided guidance that net profit would be just under $100 million (it was $101.7 million). It seems to me that there wasn’t enough unexpected bad news in the result to trigger a 25% fall in 2 days. So what might explain the sudden fall in the MTS share price? Uncertainty. While its hard to pinpoint the exact reasons for the uncertainty surrounding MTS, here are some of the commonly cited concerns about the company. Uncertainty surrounding the eventual cost and success of MTS capital investment. Too little too late. MTS has under-invested relative to peers over the last few years. The risk strategic initiatives won’t deliver the turnaround that management are expecting. Concerns that MTS will lose market share in its food and grocery business. There have been several articles in the press recently pointing out that Aldi has recently knocked MTS down from 3rd to 4th place in market share for food and groceries. Current market conditions and investor preferences may also be playing a part. For example there is degree of pessimism about the Australian economy and the prospects for companies exposed to domestic consumer demand. This is why many Australian equity fund managers are over-weight stocks of companies that earn most of their revenues overseas. Also stocks with a high dividend yield have been highly sought after over the last 2-3 years. Consequently a company such as MTS, reducing its dividend to re-invest, may be out of favour. It will be interesting to see how things will go for MTS. My gut feeling is that it may take some time before it becomes clear whether or not MTS is a bargain or a “value trap”**. I’ll keep you posted. * The chart shows the change in market price and not total return (i.e. including dividends) for the period. ** A stock that is cheap for a reason and therefore not good value.